I push myself. I guilt trip myself when I run from my pushing of myself. I get out my game of Guilt Tripping and play against moi when I am feeling creative and life serves stagnation via detours away from my studio. Bad bad girl! Not giving myself time to do my little artsy adventures creates within me a feeling of not functioning properly. I do know however, that I will return to my studio and I will once again breathe deeply and let my imagination manifest. When I find my way back to myself and get off those detours involving other people, I embrace my unfinished work and try to re-discover the energy needed to get in that particular zone of manifesting. It is important to me (am I an odd duck here?) that I tap into the feelings, the imagery, the ambiance within that I was surfing on before getting derailed. What am I trying to say here? I am trying to say that even with derailment of my intended, well planned out time allotted to myself in my studio I can eventually reclaim or rediscover what it was I thought I was channeling and finish what I started ... usually. In January of 2011 (this is now February 2012) I began the exciting process of creating a prayer bowl using a gourd and I just now completed the bowl. Really? Yes, really. (Where is my guilt? oh yes, right here, inside my mind!). 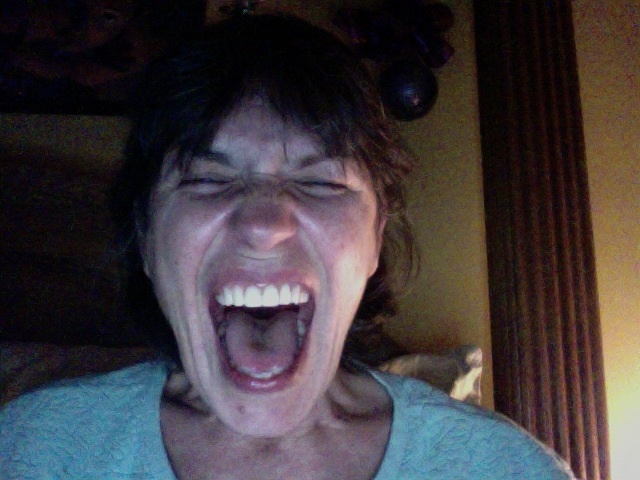 Okay, the screaming is done and so is the beautiful prayer bowl that I made from a gourd! It's not the fault of the gourd that the journey from selection, to first cut, to burning, to painting took so long. Well, the truth is this; part of the time it took to complete the project was the gourd's fault. 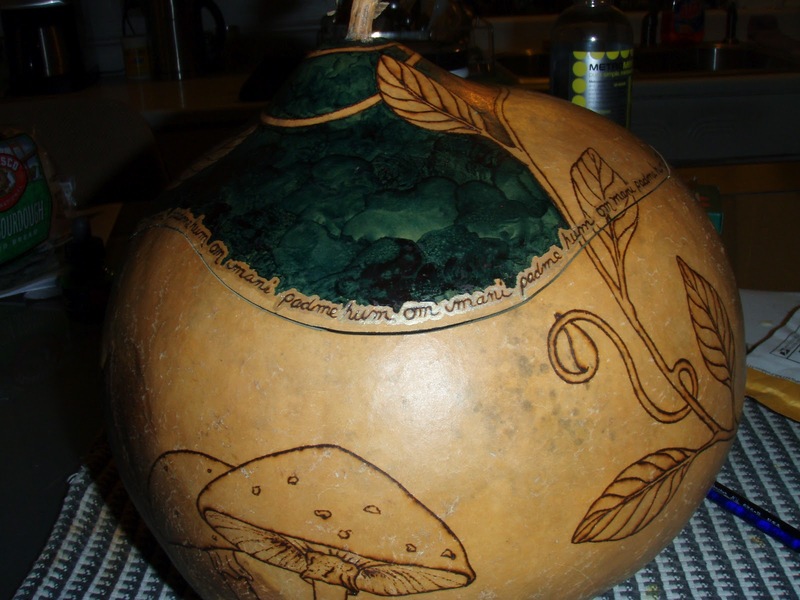 If that gourd had revealed it's flaws to me sooner than later I would have selected a different gourd. BUT ... had I selected a different gourd I would have missed out on amazing creative problem solving journey. 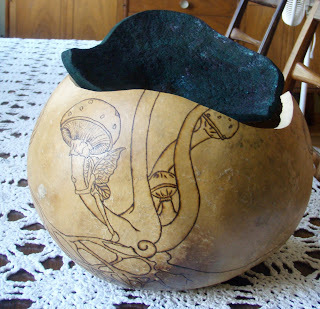 This journey, with THIS gourd involved cracks in the gourd that were well hidden. This journey involved a gourd that felt "thick" before cutting, and then that thickness became thick inner fluff with a thin, brittle outer shell. This journey involved two major hospitalizations of my aging mother; one hospitalization lasted 45 days. This journey involved running out of my selected color dye half way through staining the gourd! This journey derailed because of my own medical adventure that involved surgery and a recovery that lasted for two months! This journey involved emotional hardships involving people who should not matter but do. 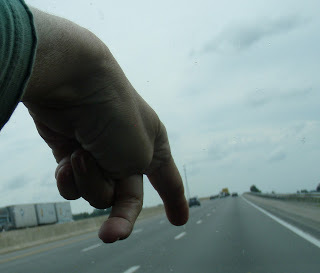 This journey involved emotional hardships involving people I love who broke my heart (or I let break my heart). This gourd has been a journey involving a lot of time, a lot of creativity beyond just design and execution of design ... creative problem solving to the max! This journey has been a circuitous path towards completion. 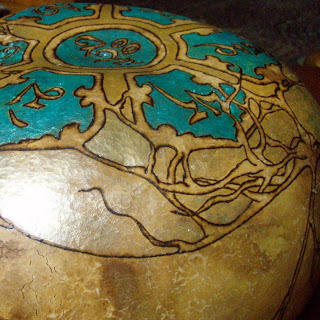 Completion of a PRAYER bowl. What? Yes, a prayer bowl. In retrospect, I see how all those little distractions that I thought robbed me of time and robbed my creative juices were distractions held in prayer. 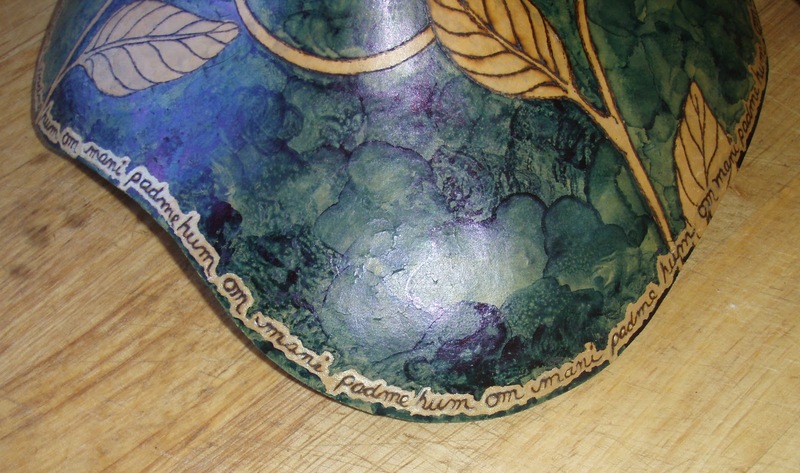 For each obstacle I encountered I would use prayer as a means of discovering strength (without thinking of the fact that I was creating a prayer bowl). I prayed for understanding. I prayed for healing. I prayed for tolerance. 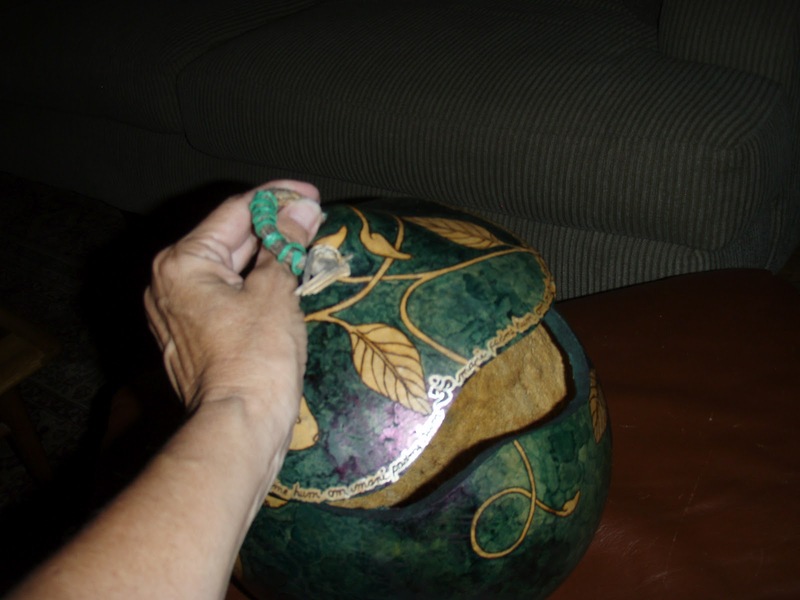 The day I packed up the completed prayer bowl it hit me. I had received all I placed my intentions upon. All my little prayers I offered up were manifested. I held within me an understanding of life from a new perspective; a perspective I had not used before. I was healed in more ways than just on the physical plane ... my heart had healed in a way I never believed was possible. And tolerance is now a way of life without question. 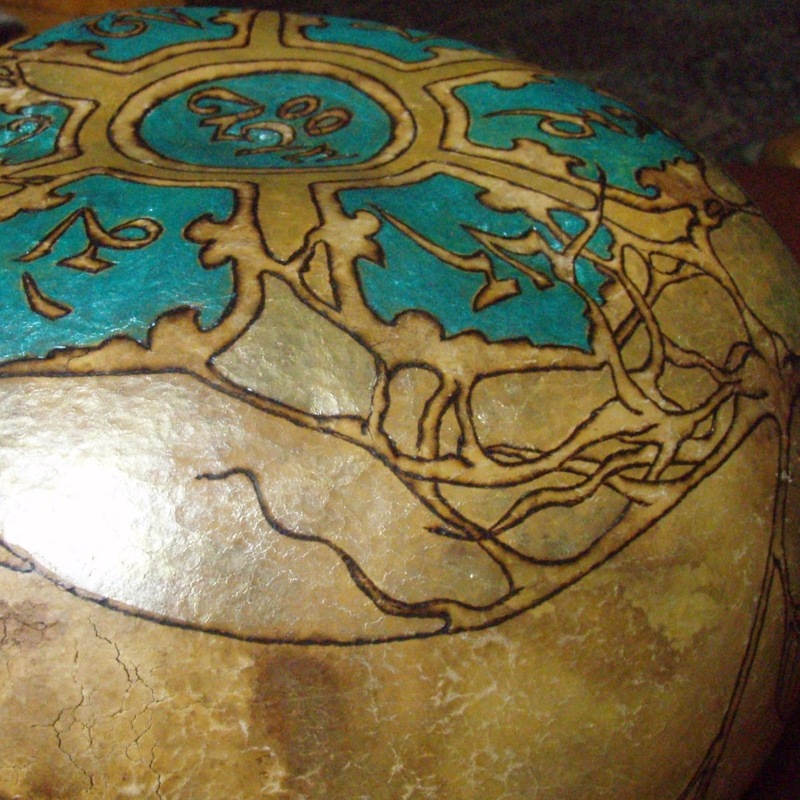 Without the thought of the fact that I was making a prayer bowl for another soul, I used the energy of this vessel to assist me with my own needs. As I stood holding this beautiful manifestation in my hands, preparing to send it off to its new home I became so aware of the eventuality of our intentions and that with time, and creativity, and a willingness to let go of the need to feel in control, all things come to completion. It is the "letting go of" combined with faith that took me back to my original path but that path is now paved a bit differently .... at least for a little while. 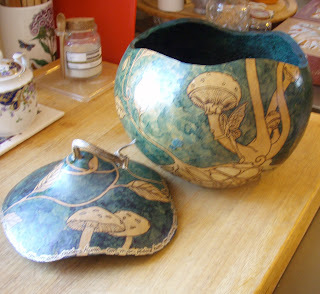 Thank you for reading my blog Elle, it means a lot to me to know that a soul has given me space in their day :-) I love writing and I love using my camera and I love working on my gourds and I love my family and sometimes everything collides! 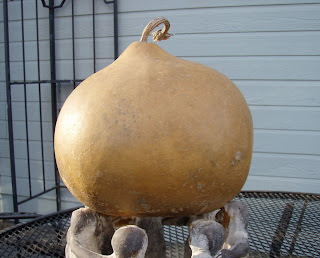 As far as an odd medium to choose to work with it was all serendipitous how gourds became my medium for visual art. I planted gourds seeds given to me as a gift. My bounty was 70 gourds! What to do with 70 gourds? The rest is history :-) I have been working with gourds for 12 years and continue to find them a rewarding medium. Thank you Lisa, Thank you Maryrose. Thank you for reading my account of my year long journey with a bowl and my life. 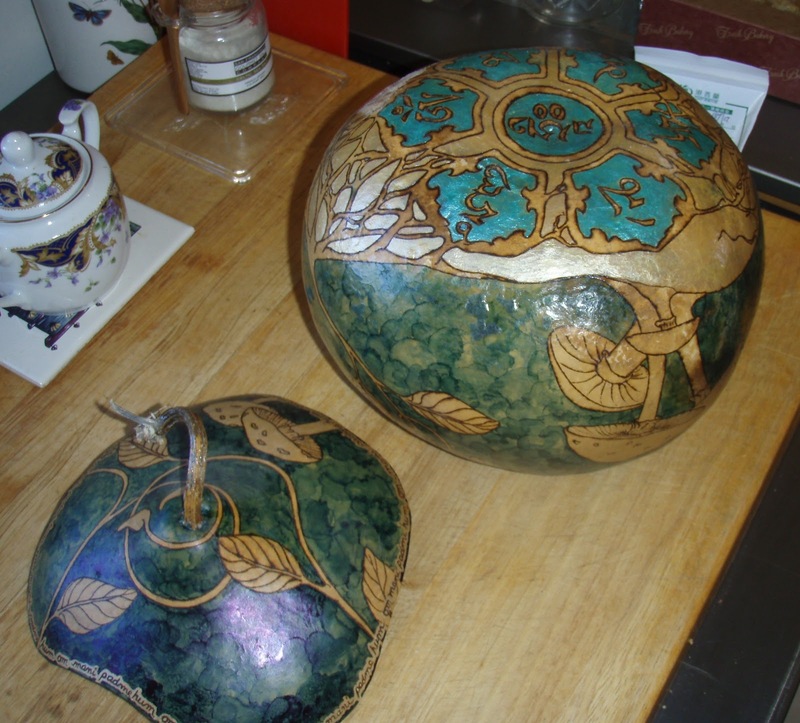 I love working with my gourds and I often find my life becomes a part of the art of the gourd itself. not only are these absolutely gorgeous, they represent something i value so very much---the pouring of our feelings into creative work and then waiting to see what happens! beauty from ashes perhaps? or just beauty from chaos? i don't know. but i know there is alot of love and life here. ad i respect it and love it. 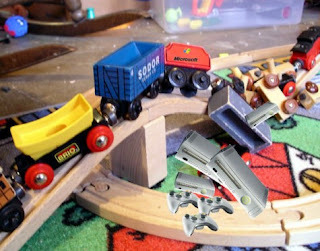 thank you so much for sharing, maryanne!